This is a link to the book below. Note, I am giving some Wikipedia references for background, you should be aware the Wikipedia info is not always accurate. This story is easy to follow if you are already familiar with the background. It spans a long time and covers many scenarios. My intention is to write an article which makes it easy for people to understand who are unfamiliar with what as been happening. A friend has been investigating this for decades. 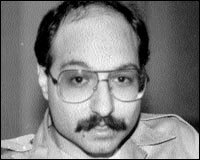 In approximately 1981 a naive and patriotic American Jew called Jonathan Pollard is recruited to spy for Israel. No doubt he imagines he is doing his patriotic duty toward Israel and probably towards the USA, as he imagines these two nations are in fact allies. Unfortunately life is not like that. 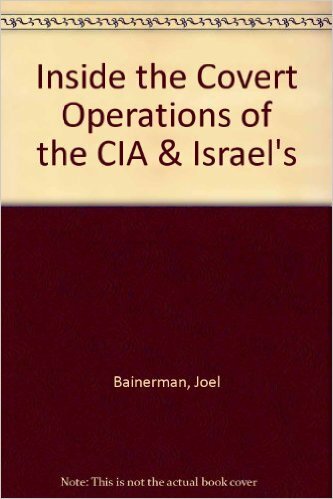 Pollard`s handler is a veteran Israeli Intelligence expert called Rafi Eitan. Naturally Rafi Eitan had other agents working for him in the USA as well. Pollard would not be privy to who they were. Eitan had been involved in the plot which brought Adolf Eichmann to justice. In 1984 Pollard supplied information to Israel which led to a shipment of arms being intercepted. This led to a situation which becomes mind-boggling. The information which alerted the Israeli`s to the illicit arms shipment also revealed to them the existence of what was to become known as the Iran/Contra scandal! Loftus, Aarons, “The Secret War Against The Jews: “Pollard notified the Israelis, who passed word to the Greeks, who raided the arms ship. None of the players knew that this shipment was directly connected to an event two months previous, in which US hostages had been kidnapped in Lebanon. The ship had not been commissioned by Arafat but by US Vice-President Bush and was ultimately destined for the patron the of Lebanese kidnappers, Iran. The shipment marks he true beginning of the infamous Iran Contra scandal. Pollard`s problems had just begun. Unknown to him all the information he was relaying to Israel was being scrutinised by a certain Shimon Peres who was now in government office. What Pollard also did not know was the fact that Peres is one of the world`s leading crooks. 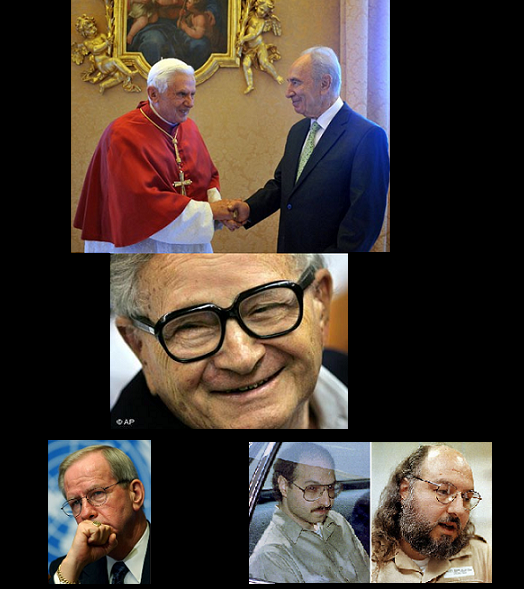 Peres is a Vatican agent, he was educated by Jesuits in Poland. Peres had now at his disposal vital information which gave him leverage over the US government of the b movie Hollywood actor Ronald Reagan. Naturally a crook like Peres is not going to use such leverage for the good of his nation and fellow country men, he is going to use it to further his own interests, that is exactly what Peres did. He saw an opportunity to make big, big, big, bucks and he made sure he was cut into a slice of the Iran/Contra action. You may read in Wikipedia that the Americans asked the Israelis to participate, this is not true. Peres muscled his way in via Pollard`s info. “But by September, Peres had sent a team to Washington consisting of Yaacov Nimrodi, the former Ambassador to Iran, Al Schwimmer, former head of Israel Aircraft Industries, and David Kimche, chairman of the Israeli branch of the Council On Foreign Relations. After that, Israel was right in the middle of the operation. This is basic indisputable logic. Israel joined the operation only after Pollard’s intelligence exposed the existence of it. That means Peres wanted a piece of the pie and must have used Pollard’s data to get his cut of the action. Everything seems to have went very well until November of 1985 when Pollard was arrested. At that point Nimrodi, Schwimmer and Kimche quit the operation and got offside. Being very greedy and having the benefit of being a very, very,very highly Vatican controlled, protected species, led Shimon Peres to continue with the operation so he replaced the former team of three with his anti-terrorism advisor, an individual called Amiram Nir. Nir was later conveniently murdered in 1989 just before he was to testify before the Senate committee investigating the Irangate scandal. Some sensitive intelligence material was out of Pollard`s league as it needed special authorization and special codes to access it. There was a way around this problem. Rafi Eitan had another contact in the USA who could supply the neccessary authorization and codes which would allow Pollard to access the information. The man was Robert McFarlane. The highly classified information obtained in this method by Pollard revealed more lucrative secrets for Peres to exploit. Lo and behold, it was revealed that the American corporation Bechtel was making chemical weaponry for Sadaam Hussein. Two American governmental VIPs were linked to Bechtel, one called Caspar Weinberger and the other called George Schutz. Not only did information reach Israel about Bechtel supplying chemical weapons of mass destruction to Sadaam Hussein they also found out Bechtel`s plans for a multi million dollar project in the Middle East. Iraq wanted to build an alternative oil pipeline to Aqaba, Jordan`s Red sea port. However there was one proviso, Bechtel wanted assurances that Israel would not destroy the pipeline, even in time of war. Attorney General Edwin Meese approached Peres who agreed to protect the Iraqi pipeline in return for $70 million per year paid to the Israeli Labour party. They guy who supplied the codes to Rafi Eitan, Robert McFarlane was also an enthusiastic backer of the pipeline project. “McFarlane was also the major White House backer of the Iraqi pipeline deal. To bebuilt by the Bechtel company it would feed 300,000 barrels of oil each day from Iraqi oilfields to a terminal at the Jordanian port of Aquaba. As part of the arrangement, then Israeli Prime Minister Shimon Peres’s Labor party would receive up to $1 billion over a ten year period in return for a pledge not to bomb the pipeline in the event of a war. Originally, it may have been intended to have this money come from the Pentagon’s budget. When John Poindexter took over from McFarlane as National Security Adviser in December l985 he killed a plan his predecessor had come up with to have secret payments made to Israel out of a heavily disguised National Security Counsel-controlled appropriation in the Pentagon’s budget. (Washington Post, March 5th, l988) “The idea was for it to come out of the defence budget on an installment basis,” one source was quoted as saying. “It was, to be a payment to the Israelis to be good.” (Washington Post,February 25th, l988) . It may be nothing but a mere coincidence, but Israel’s spy in Washington, Jonathan Pollard, was operating throughout McFarlane’s period as National Security Advisor. A month after Pollard was arrested, McFarlane resigned. Yet six months later he is leading a delegation on a secret mission to Teheran. Why didn’t National Security Adviser Poindexter go? So here’s what the Peres government did with Pollard’s intelligence: they put the squeeze on Bechtel and that meant on Caspar Weinberger. The threat was simple enough: if you guys at Bechtel don”t find a way to funnel me a lot of money, $700 million will do, we’ll expose the Iraqi gas plants and sabotage your pipeline deal. Hence, the insurance policy excuse was formulated under great duress. When a very peeved Weinberger discovered that it was Pollard who was passing Peres his blackmail weapons, he showed no mercy. He intervened with Pollard’s judge and made sure he got life for a five year crime knowing the Israeli government could put no stop to him or risk its own massive exposure. Weinberger is home free. In 1992, President Bush pardoned him for all Iran Contra-related crimes. Shimon Peres was just chosen as head of the Israeli Labor Party. And unless this little piece of the whole truth is thoroughly investigated, Jonathan Pollard will sit for good in his cold, cold cell. I hope this encourages someone to look more closely at this case, there are a lot more people involved than the ones I mentioned. If you look closely enough it should take you to the real culprits behind the Lockerbie bombing. You may find this historic archive useful.